Visiting Sandy Cape Lighthouse and Eli Creek will get you outdoors. To see other places to visit, photos, ratings, and more tourist information, use the Fraser Island journey planner. Vienna, Austria to Fraser Island is an approximately 33-hour combination of flight, ferry, and car. The time zone difference when traveling from Vienna to Fraser Island is 9 hours. In June, daytime highs in Fraser Island are 26°C, while nighttime lows are 14°C. Cap off your sightseeing on the 15th (Sat) early enough to travel to Herberton. Herberton is a town and locality on the Atherton Tableland in Far North Queensland, Australia. On the 16th (Sun), take an in-depth tour of Spy & Camera Museum, contemplate the long history of Historic Village Herberton, and then look for all kinds of wild species at Atherton Tableland. To see where to stay, photos, traveler tips, and tourist information, you can read our Herberton trip maker website . Use the Route module to find suitable travel options from Fraser Island to Herberton. Traveling from Fraser Island in June, expect Herberton to be somewhat warmer, temps between 30°C and 21°C. Wrap up your sightseeing on the 16th (Sun) early enough to travel to Cape Tribulation. Kick off your visit on the 17th (Mon): kick back and relax at Myall Beach, then take in the exciting artwork at Floravilla Ice Cream Factory, and then enjoy the sand and surf at Thornton Beach. 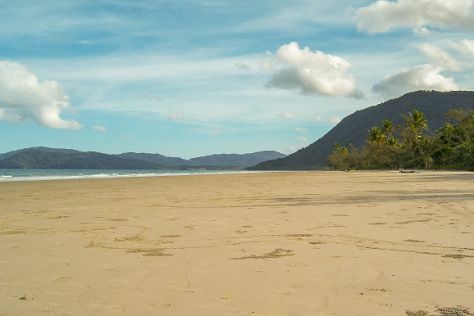 Keep things going the next day: tour the pleasant surroundings at Cape Tribulation Beach and then delve into the lush surroundings at Daintree Rainforest - Cooper Creek Wilderness. To see maps, where to stay, reviews, and other tourist information, you can read our Cape Tribulation trip planner. Getting from Herberton to Cape Tribulation by car takes about 3.5 hours. In June, plan for daily highs up to 30°C, and evening lows to 21°C. Finish up your sightseeing early on the 18th (Tue) so you can travel to Port Douglas. Visiting Safaris and Hartley's Crocodile Adventures will get you outdoors. Spend the 19th (Wed) among aquatic life with a scuba or snorkeling tour. There's much more to do: stroll through Four Mile Beach, look for gifts at With Sugar, learn about wildlife with up-close encounters at Wildlife Habitat Port Douglas, and soothe aching muscles at some of the top local wellness centers. To see traveler tips, photos, more things to do, and tourist information, use the Port Douglas driving holiday planning site . You can do a combination of car and ferry from Cape Tribulation to Port Douglas in 2 hours. Another option is to take a bus. In June, daily temperatures in Port Douglas can reach 30°C, while at night they dip to 21°C. Finish up your sightseeing early on the 22nd (Sat) so you can go by car to Cairns. Get in touch with nature at Scuba & Snorkeling and Palm Cove Beach. Deepen your sense of the past at sights like St Monica's Cathedral and McLeod Street Pioneer Cemetery. Step out of Cairns to go to Palm Cove and see Spas & Wellness, which is approximately 30 minutes away. There's much more to do: hike along Esplanade Boardwalk, admire the masterpieces at KickArts Contemporary Arts, and kick back and relax at Trinity Beach. To see traveler tips, photos, where to stay, and tourist information, read our Cairns travel planner . Drive from Port Douglas to Cairns in 1.5 hours. Alternatively, you can take a bus; or take a shuttle. In June, daily temperatures in Cairns can reach 30°C, while at night they dip to 22°C. Wrap up your sightseeing on the 25th (Tue) to allow time to travel back home.